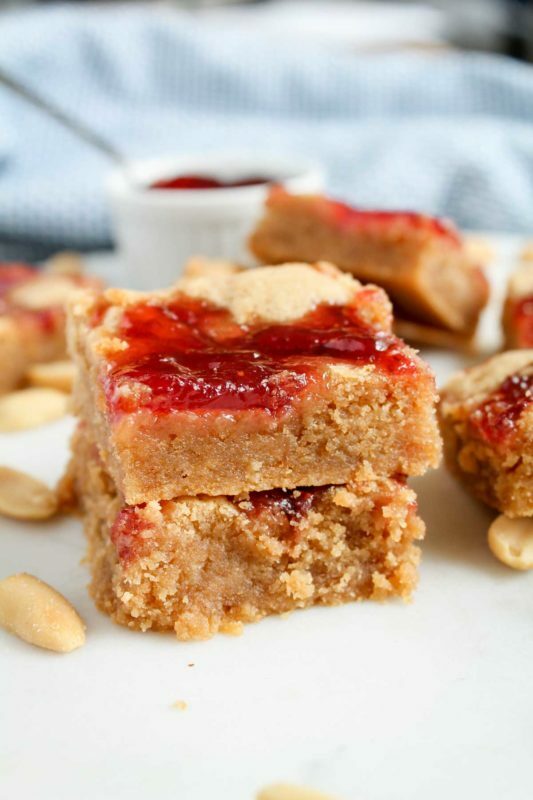 Third time’s the charm with these PB&J Bars. Sometimes with recipes, I have an idea in my head, I try it, and it comes out perfectly the first time. Then I feel pretty great about my baking abilities…until a recipe like this comes along. This one, I’ve had in my head for months, and it has eluded me to a maddening degree. You could say I’m a PB&J fan. I ate them all the time growing up, as most of us did, but I only really started to appreciate them in my post-college years, when actually buying groceries and cooking dinner was often just too much to handle (#lawschool). I discovered during this time that toasting the bread first takes PB&J to another level. Trust me. 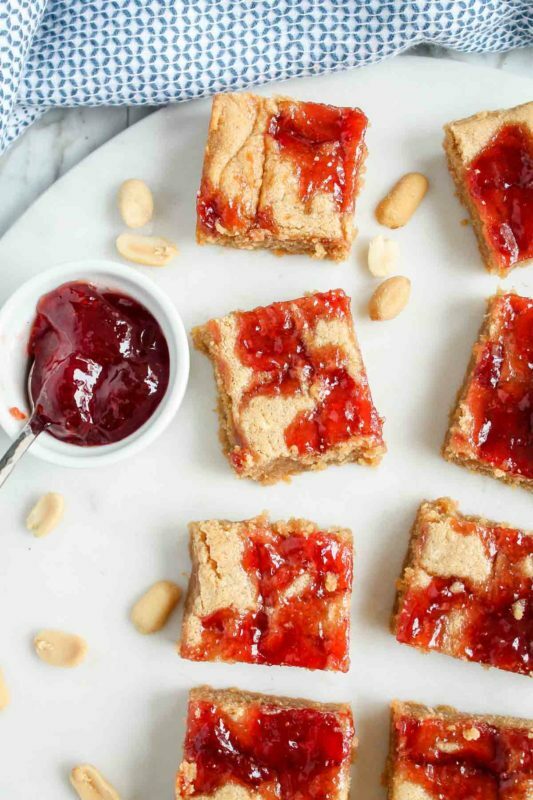 Warm, melty peanut butter (or almond butter, or pecan butter) and your favorite jam or preserves on toasted bread can be a pretty otherworldly experience. When there’s nothing else to have for dinner, a toasted PB&J on the couch is pretty great. You know what else is great? Peanut butter cookies. Brian’s ultimate favorite is peanut blossoms at Christmas, and I’m sure I’ll get a recipe on here for those sooner or later. But what about the rest of the year? I wanted to create something that would be a year round tribute to the sandwich I (and Brian) love so much. 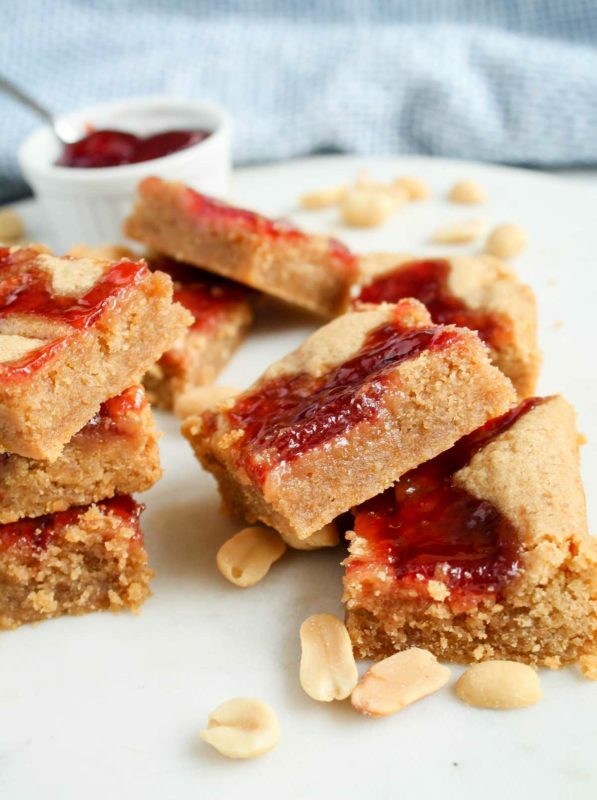 I figured it wouldn’t be hard to create essentially a peanut butter blondie with jam swirled in. 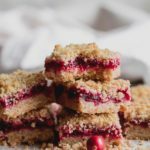 The first time I tried to make it, however, the dough was too cake-like, and the jam weighed it down and made it soggy in the middle. Epic fail. The second time, I used too much peanut butter and the result was way too dense. Epic fail. Well, the third time, I finally achieved the ethereal salty butteriness of peanut butter cookies, in bar form. 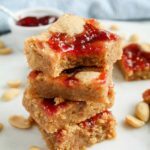 It’s sturdy enough to stand up to the sweet jam on top, and the combination is basically heaven, and childhood, in a bar. It tastes like tree houses and summer pool days and creaky swings and playing tag. 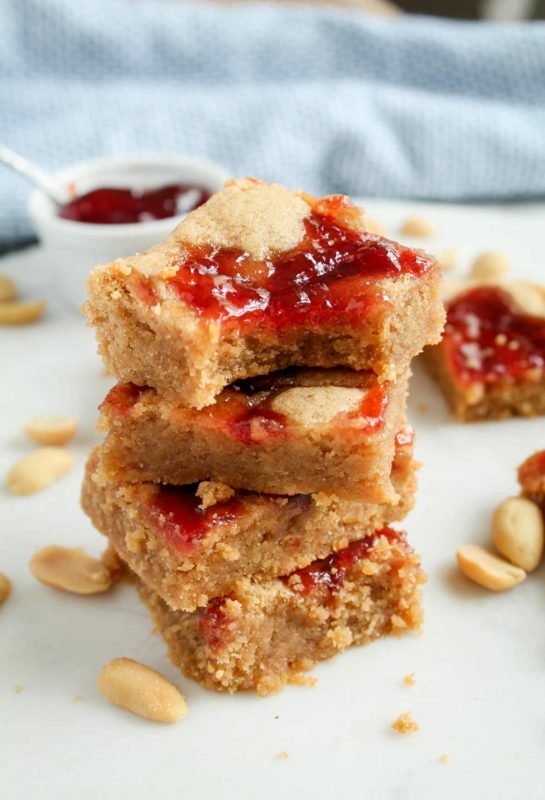 I have to apologize that I don’t have very many pictures of these PB&J bars for you. Brian ate them all before I got a chance to do a full photo shoot. I can’t say that I blame him. 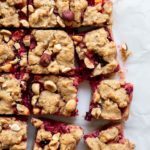 Make them for yourself, and find out why. 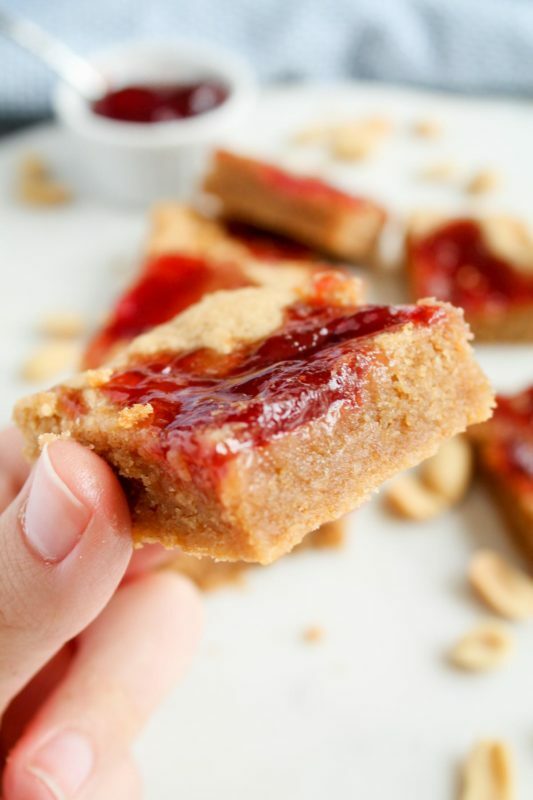 PB&J bars: your favorite peanut butter and jelly sandwich in soft, buttery, cookie bar form. Preheat the oven to 350 degrees F. Line an 8x8 baking pan with parchment paper or grease well. Set aside. In a large bowl with a hand mixer or stand mixer with the paddle attachment, cream together butter and sugar for 3-4 minutes on high speed, until pale and fluffy. Beat in peanut butter on medium speed until fully combined, then beat in egg and vanilla on medium speed until combined. Add flour, baking powder, and salt and beat on low speed until combined, but don't over-beat it. Stop when you no longer see flour clumps. Press the mixture evenly into the pan to form one layer. Dollop the jam on top with a spoon, then swirl with a butter knife. Bake for 22-24 minutes, until the edges are browned and the bars look slightly puffed. 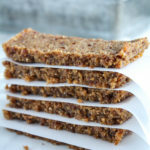 Cool completely before cutting into bars! Bars can be stored, covered, at room temperature for up to 3 days. Alternate title for this post… Peanut Butter: a love story. These are absolute wonderful!!! It’s an easy recipe. Although I a gluten-free I was able to subsitute my usual GF flour. I also used my mom’s homemade strawberry jelly. 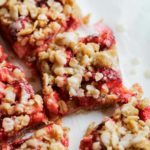 This recipe will certainly be added as a favorite dessert or snack. Thanks so much, Gina! I’m so glad you were able to adapt it with GF flour, that’s great to know. So glad you enjoyed!